My first port of call was to pay a visit to one of the Museums storage units off site to deliver some carpet samples the Museum did not have the space to store on site. I would be making the trip with Mike and Colin, who it would seem are the go to men for carpet moving. It is at this point that I met Ken, whose van we would be making the trip in. Ken, like everyone I have met associated with the Museum is lovely and his van floor was, rather appropriately, kitted out with a very nicely patterned carpet. The trip was a jovial one in which I discovered a bit about Ken and Colin’s time in the industry. 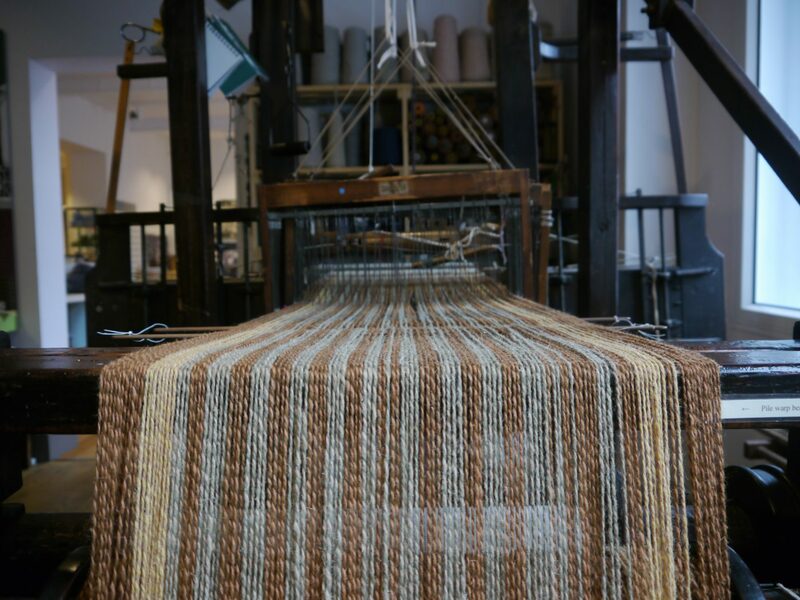 Ken had worked in the industry for 10 years before taking up his current position whilst Colin had been a Weaver for 41 years! Upon arriving at the offsite store we enlisted the help of a fork lift truck to raise the boxes of carpet samples to the level on which the store was. Apparently carrying the boxes up stairs had nearly killed Colin and Mike last time. Upon reaching the store Mike and Colin explained the process of storing the carpet samples in terms of company, condition etc. Back at the Museum I shadowed a tour around the exhibits to learn what constitutes a tour and what factors must be considered when showing a tour, for example the age of the group. I aided Audrey in organising the tour as they had a look round the Museum and received demonstrations of a spinning wheel from Jill and a weaving demonstration from Dave. I also had the pleasure of joining the group for a demonstration of the big power looms by Bernie and Mark. It was fascinating to see these feats of engineering and amazing that Bernie and Mark had the skill to operate such machines. The group, like me was enthr alled at how these machines turned spools of thread into carpets and both Marks and Bernie’s knowledge did not let us down and explained everything in as much detail as you could hope for. These power looms are definitely the stars of the Museum and a sight to behold. As the only working ones in the Country I strongly recommend that everyone comes along and witnesses this massive part of Kidderminster’s history in full flow, just like it was back then. After that came the more sobering, but equally as important task of pest control. Being as this is a Museum solely of carpets pest control is highly important in the conservation of the carpets on display in the exhibits, and in storage. The main pest problem is moths as this place is literally moth heaven. To regulate pest control, and improve the conditions the carpets are kept in, the Museum uses a simple but effective method known as Blunder Traps. They are essentially sticky pads that are placed on the floor that bugs wonder over and get stuck. My task was to go around the Museum picking up these Blunder Traps and counting and identifying the insects on them. I then recorded this information and laid out new Blunder Traps. The Blunder Traps are checked about every three months. Again this was valuable experience in the day to day running of a Museum, one that I had not previously considered was a part of it.